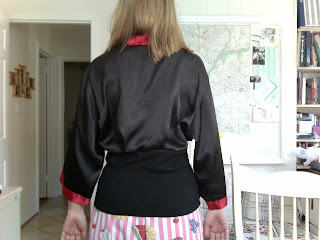 I bought a satin robe at a thrift store because I wanted the material for another project. Looking at the top on the hanger, I couldn't help but think it would make a great kitschy kimono top. I searched the Internet hoping to find a tutorial to tell me exactly how to make one. I found an inspirational picture and a tutorial that didn't fit my materials but was helpful nonetheless. I love people who make Internet tutorials and share their knowledge. I hope to be one. 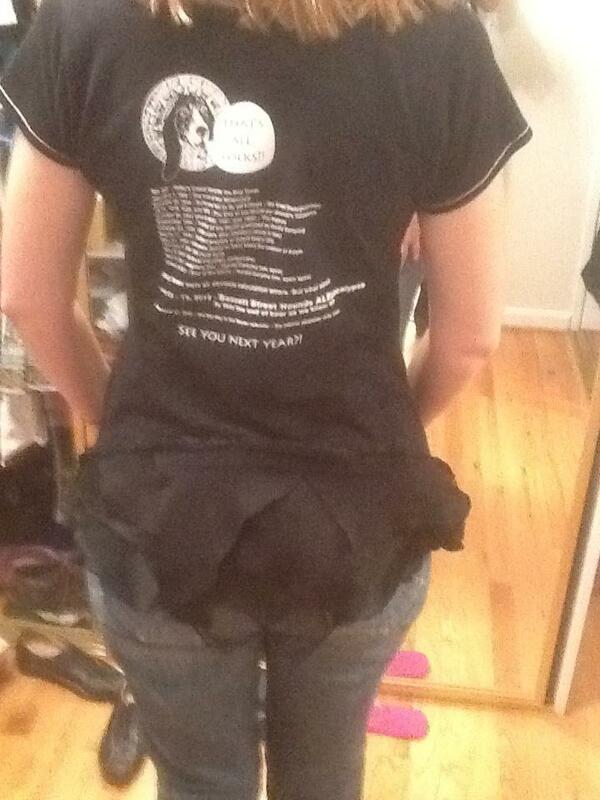 I had a black t-shirt that was a bit tight on top that I thought would be perfect for the bottom. 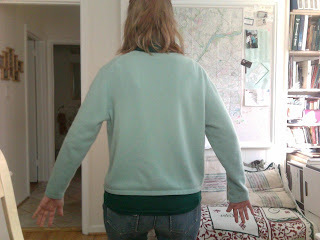 So, all I had to do was sew the top of the robe to the bottom of the knit shirt, what could be easier? Well, it was pretty easy but as a novice sewer, it took me about 4 hours with the results being slightly wonky but still wearable in my book! Sorry I don't have step-by-step pictures. The first thing I was try on the robe part and pin it where I wanted it to close, checking to be sure that I'd still be able to get it over my head. Then I stitched horizontally across the bottom of the robe top to keep it closed. I thought just sewing the black bottom on wasn't interesting enough, so I decided to add some of the red trim to the front waist for a sort of belt look. 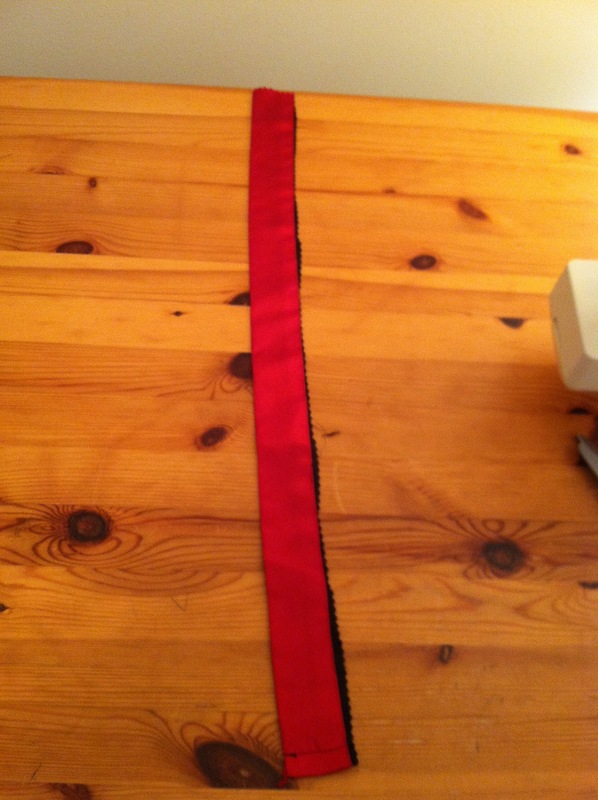 When I cut the bottom of the robe off to use for my other project, I did not want to use the red trim, so I cut that off and saved it - this is what I used for the front belt. 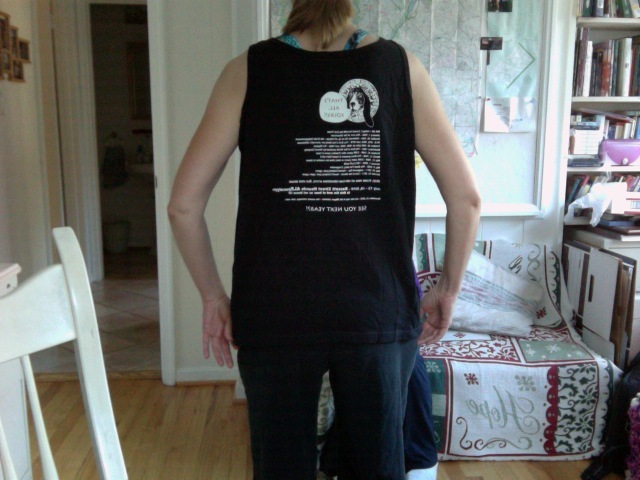 If I was an adept sewer, I might have put one on the back as well. I opened it up and ironed it flat. Then I started to play around with it. I ironed one edge down to hide the raw ends and stitched that, right sides together to the robe where I wanted the waist to be. I didn't measure anything, just eyeballed all of it and left the rest of the robe without trimming it up. 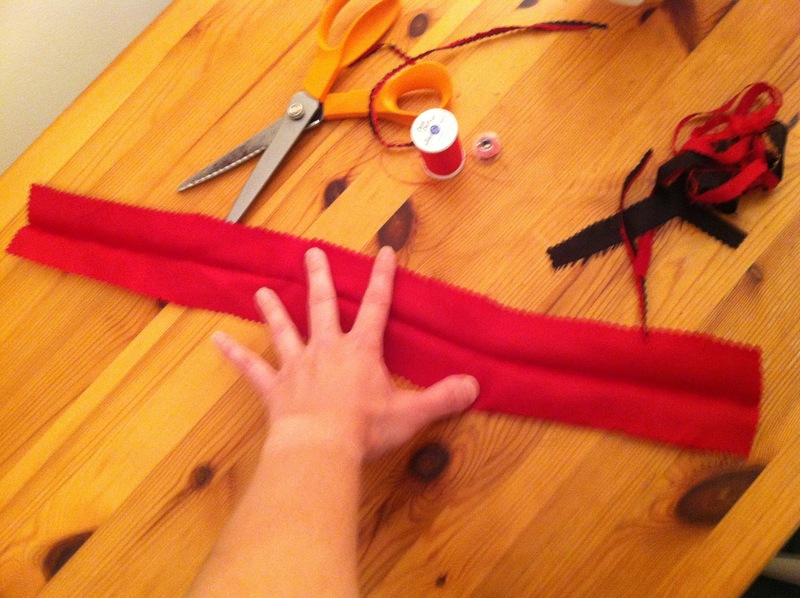 Since the satin was so slippery, I started to sew from the middle to one end. 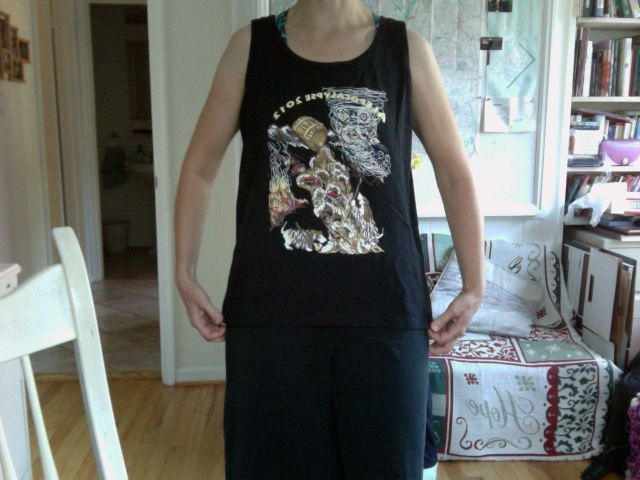 Then I sewed from the middle to the other end. I went back and top stitched the belt down, leaving a nice-looking finish, if I do say so myself. Now, here is where things got really fun and I stopped photographing. I tried on my t-shirt to decide where I wanted to cut and decided to cut a bit higher than the waist of the t-shirt because I wanted the kimono top to have a bit more length than the t-shirt did. Since the t-shirt is knit, it didn't matter that I cut it above its waist, it shaped nicely around the new waist. 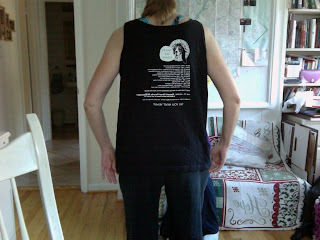 I pinned the t-shirt bottom to the top of the robe and was really sort of random about it. I safety pinned, tried it on, checked the mirror. 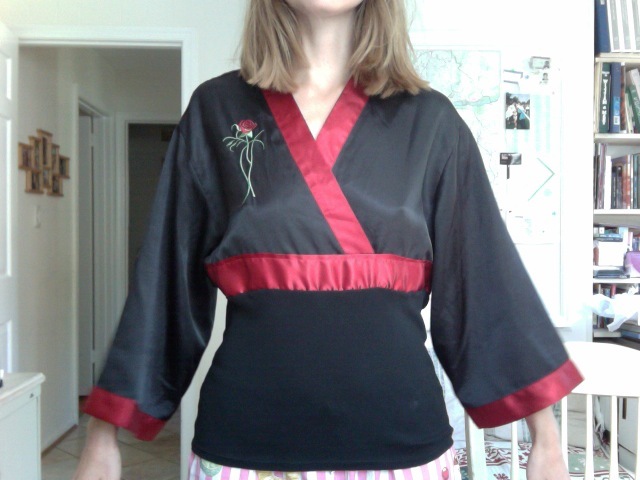 For the front, I just sewed the t-shirt and the robe belt/red strip right sides together. I did not top stitch it down like I had with the top of the strip. Why? well, I didn't want to really. I thought it might affect the fall of the back of the knit top and/or didn't know if it would create some sort of pull on the front. Basically, I didn't care all that much. One concern I did have was that I find sewing on knits to be a bit difficult. I read a hint to use tissue paper underneath the knit when sewing on a machine and I have found that it does help. In this case, I just made sure I was always sewing with the satin robe on the bottom and the knit on top, so I pinned and re-pinned, changing the orientation so that I was always sewing with the knit on top. Not bad for 4 hours and a newbie sewer. 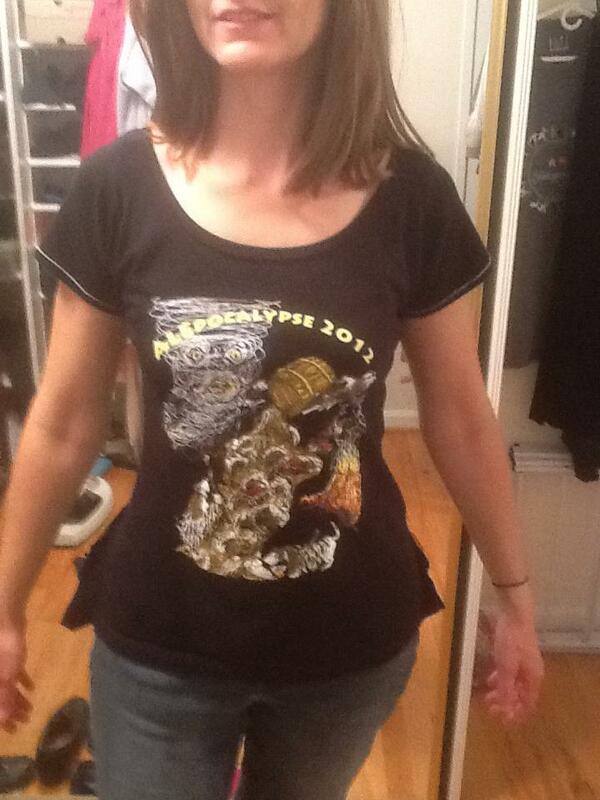 And I've actually worn this in public a few times. 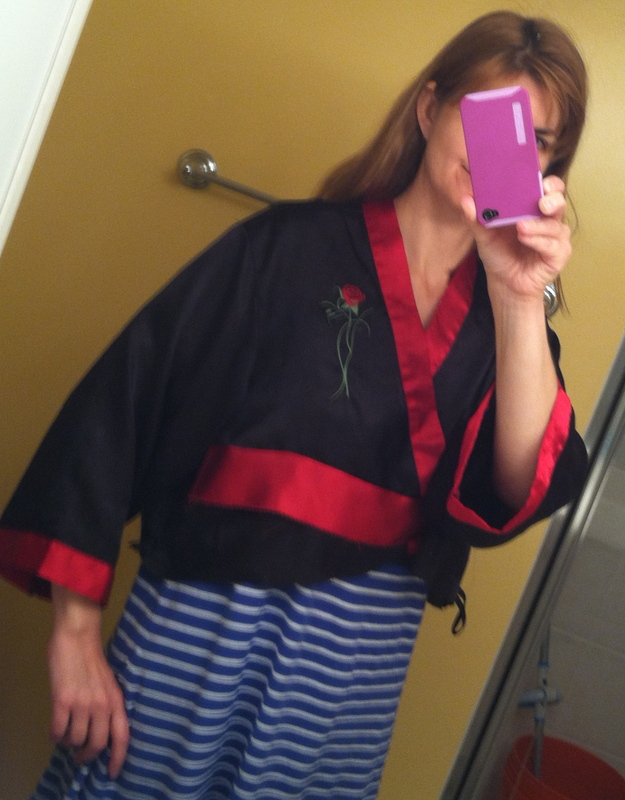 A note about the edges -- I used pinking shears to cut the edges but the 100% polyester robe seemed eager to fray. I had learned from the Internet (various fabric flower making tutorials) that man-made materials melt nicely to seal off edges so I took a lighter to the inside robe seams. Aware that the melted seams might scratch me when I wear the top, I took the extra length from the knit top and sewed it over the edges. This might not make sense but a lot of my approach to making this top didn't make a lot of sense and was trial-and-error all the way. My only concern now is that wearing a 100% polyester top is a bit like wearing a trash bag. Given that it's black, I'm concerned that wearing this out in the sun will turn this into one of those "sweat it off weight loss" tops. I've got some writing to do. 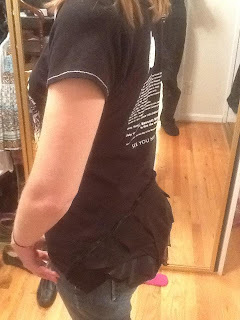 I have slowly been getting into clothing reconstruction and need to write up my projects. I'd love to post tutorials as I've seen so many wonderful ones on the Internet that have helped and inspired me. If there is anyone out there reading this nearly defunct and oddly focused blog, maybe you can let me know if there is anything in particular you'd like to see and the might encourage me to post. My projects are all a bit unorthodox because I can't draw straight, cut straight or sew straight. The concept of using a pattern and starting with fabric bores me. I'm most interested in taking thrift store buys or something I have and don't wear and converting it. I am a novice sewer. Sometimes I do try to be accurate but I just don't think I have the genetic disposition to be a neat person (you know, those people with neat handwriting and who can do things gracefully and accurately with such ease). I'm sort of a mess, but I'm having a heck of a good time. I've been spending my computer time on Facebook and Pinterest. I'd like to return to blogging to memorialize my clothing reconstruction projects. This will require that I upload photos I've taken and that I write posts. Wonderful ideas but I'm not sure whether life will allow this. Still, I should try. This sage green 2 ply cashmere cardigan feels yummy but looks dowdy. 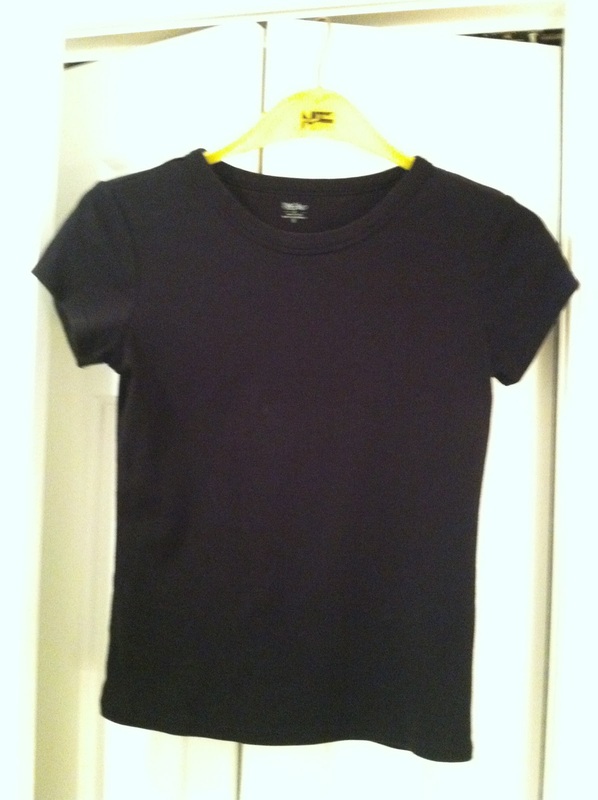 It was very large on me but I machine washed and dried it and it shrunk a bit. 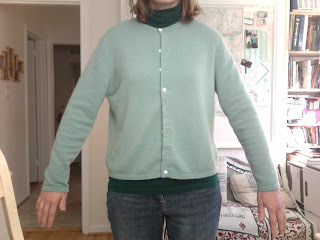 I don't like the boxiness of it and I could just try to shape it, but I don't think I want a cardigan anyway. I'm also a bit nervous about cutting this. this is a project waiting to happen -- I've been pinning lots of remake ideas on Pinterest but haven't gotten around to it yet. I sometimes answer questions from new homeschoolers or those considering homeschooling as part of my volunteer work. Here is one response I wrote to a parent of a 12 year old who is considering homeschooling next year. This response was to his follow-up question asking me what curriculum I use. I know that I can sometimes be very defensive (and offensive as a result ;-0) and strident about homeschooling, but this is actually an even-tempered response that might be informative and helpful to some of my friends. That is why I am sharing it here [originally published as a Facebook note]. We used Singapore Math last year. Before that, we didn't really use anything or you might say we used a bit of everything, just not packaged curriculum. My kids are self-motivated and we've always had lots of learning materials and books in the house and available to them. We love the library and its amazing the resources available there. We've also been involved in co-ops with other parents and homeschoolers. What lead me to this approach was reading Mary Hood's book The Relaxed Homeschool -- she has a PhD in education and her book made a lot of sense to me. A very relaxed approach has worked well with my kids though I understand that others want or need more structure ororganization in their homeschool. I also enjoy books by John Holt, especially Teach Your Own and Learning all the Time. Since your child is 12 and has been in school, this relaxed approach may be very unappealing to you (or might seem slightly insane). Also, you may have concerns about academic performance and having the ability to return to school in the future. This is why it's good to join the lists and talk to a variety of homeschoolers. There are many ways to homeschool and to prepare your kids for college and beyond. What I love about homeschooling is the ability to question the educational assumptions of institutional school. We started our journey when the kids were very young, so I spent a lot of time reading educational theory and about various approaches to education and I didn't need to worry about what they were learning or how fast. Now, as my kids get older (I have a 12 year old as well), I am beginning to get a bit more concerned about whether our relaxed approach will continue to suit us well. You might want to think about your goals for homeschooling as well as for your child. My goals for my kids are that I want them to be good, honest, productive people with strong family relationships. I'm a little murky on how the whole college thing is going to work and I do expect that my kids will get at least bachelors degrees. I follow what the homeschoolers with older kids are saying on the lists and I know that it will work out. So far, our needs are being met. Like I said, my approach might not appeal to you at all and that's why it's important to talk to other homeschoolers. There are plenty of people who use curricula that they love and are happy with (and they may have used several different ones over the years because what works well one year might not the next). I would suggest that you not jump in too quickly or spend too much money because what works for one kid might not work for another and you don't want to sink a couple of hundred dollars into one curriculum only to learn about another curriculum that might work better. One thing a lot of us homeschoolers like to keep in mind is that we don't really have a timetable like the schools do. You are not required to have math, science, language arts and history taught every day. If your child has a strong interest in a subject or topic, you might be able to use to study cross-curricularly, something that schools may not be able to do, especially at the higher grades where each subject has a different teacher (one approach that does this is unit studies; but you need not formalize it). Sorry, I feel as if I've babbled a bit. I suppose my main point is that homeschooling is an opportunity for you to look at education from a different perspective than the school system has offered, if you choose. There are many museums to visit and activities to do and lots of ways to learn that look nothing like what an institutional school has to offer. Otherwise, there are a number of packaged curricula that might work well -- going on a list and describing your child (learning style, special needs or gifts, what they like) might help you find out what worked in families whose children are similar. I wrote a blog post for Orlando Informer. It's a subscription site but I believe the blog is public.